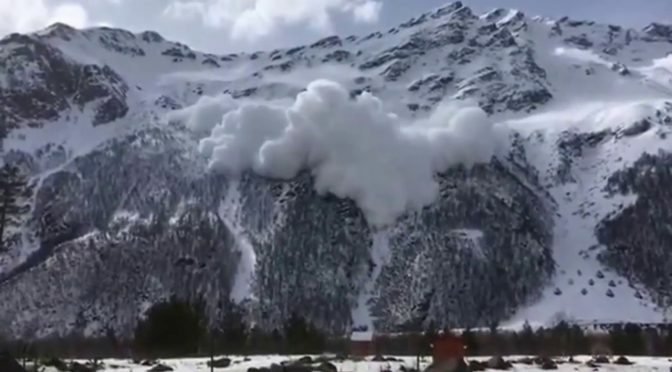 Kabardino-Balkaria, Russia – An avalanche that authorities are blaming on snowboarders riding in a closed off-piste area killed seven in the North Caucasus ski resort of Cheget on Friday, with the massive slide caught on video. The victims are said to include newlyweds Yana Shanina, 25, and Vladimir Shanin, 29, as well as Nina Sobol, 27, Alexander Ivanov, 34, and Oksana Sannikova, 30. Identities have not yet been released for the remaining two victims. Authorities indicate that the victims intentionally passed warning signs and barriers to ride the closed terrain, triggering the avalanche at just after noon on Friday. One rescuer indicated that the area where the slide was triggered has been closed since the beginning of the season.